I'm really into good bags. Bags that not only look cool but also work well for what they are made for. For me it's about Form and Function. If a bag has both I'm a fan. When I started my search for a diaper bag I had low expectations...I thought I'd have to get a women's bag in black or grey. I didn't realize that they make them in styles for men. Then I started doing research and realized there are some daddy diaper bags out there. 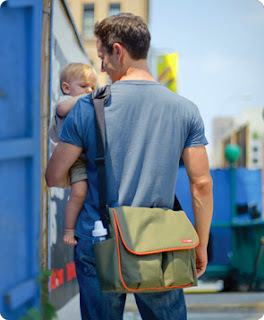 I found 4 bags that are geared towards dads....there are more but if you're looking for a daddy diaper bag I think this round-up will be a good start. These are order of when got to check them out. 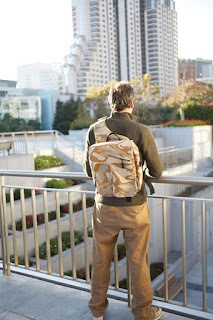 Dad Gear actually makes 4 styles of bags; the satchel, messenger, backpack and courier. They all come in a bunch of designs but the first three are available in the billboard series. What I like about the billboard series is that each one is unique...and they remind me of Freitag bags. The front flap is made from the vinyl of recycled billboards and since billboards are meant to withstand the elements these should withstand day to day use with no problem. You can check out their site from the current styles available...they change often. The actual bag seemed really well made and well thought out. It's made from a sturdy polyester material that should last you a while...it was pretty thick. I was really digging the two bottle pockets that are accessible from both the inside and outside...what's cool about that is there is quick access when needed. A cooler feature is the that under the front flap is a pocket with a wipe window...it allows you to grab wipes without having to open any pockets. The bag has the standard features too, including: changing pad, a lot of pockets and a strap so it can hang easily from a stroller. This messenger bag was quite spacious but not too big. The only thing I wasn't loving was that the front flap, the part with the billboard image, was stuck on with Velcro. I asked the manufacturer why it was like that and they let me know it was for easy cleaning (I can see these things getting pretty dirty) and so you can change up the design if you want. I do have to say that the Velcro on this flap was some crazy industrial strength and I wouldn't fear it coming of by accident. The billboard series Messenger bag sells on their site for $99. Other styles of the messenger are $82. Diaper Dude seems to be the most ubiquitous of the daddy diaper bag brands. They have a good number of styles available like a messenger bag, a Diaper Dude deluxe, backpacks and this original Diaper Dude style. I was really looking to get my hands on this bag. Once I did get ahold of it I wasn't digging this bag at all. I had seen it after the Dad Gear bag which was sturdier. This bag is made from a thinner shiny polyester and I am not sure how it would hold up. In addition it was rather floppy and small. It might be large enough for a couple hours but I'm not sure I'd be able to stuff it with the necessities and add a camera to the bag....and I carry my camera around a lot. Maybe some of the other styles are nicer but the stores around only sold this style. The Original Diaper Dude has the standard features too: a stroller strap, changing pad, three exterior pockets and one main pocket. It didn't have a dedicated easy access wipe pocket like the Dad Gear one...but I wouldn't have missed it had I not seen it on the other. This bag sells for $55 while some of their other styles sell for $99+...like I said maybe some of those are better. Fleurville has a bunch of styles of diaper bags but they are all pretty femme except for this DJ bag. When I first saw it it reminded me of my favorite urban day pack...the Dana Design Double Shot that Staci bought me 8 years ago...it's so well made I still have it and it looks great. Sadly Dana Design was bought by Marmot and while I'm sure their tech bags are great I'm not excited by their urban packs. This bag has some great features that are not on the others including two fleece lined pocket for sunglasses and such...that would be awesome if I could find any of the many pair of sunglasses I have bought. I realy like that there is a removable insulated beverage holder. And it has a easy wipe access pocket...although it doesn't have a window like that Dad Gear one that rocked. Other features include: an offset zipper for quick access to diapers, a good size interior space with 2 pockets and an expansion zipper that increases space by 25%. It does not have a stroller strap. My favorite accessory of this bag, is that it's PVC free...that's cool but I kind of wish it was made of the material they call Re-Run which is made from plastic bottles (Diaper Dude has an eco bag made of a recycled bottle material.) In addition Fleurville was named as San Francisco Bay Area Green Business. When I have a choice I sway towards eco because to me it just makes sense...and I think it's worth the extra cash if any. You can check out their eco practices here. I do have to mention that Fleurville was bought by JJ Cole...I don't know much about either company but I hope they don't lose this bag when they become one. 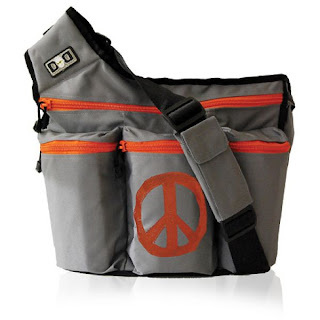 The Fleurville DJ bag runs about $89 to $120 on Amazon depending on the color. Pros: Sturdy, good storage, awesome access to wipes and nice front flap design. I think you could use this as a personal bag when your kid is older. Cons: Front flap is Velcro-ed on...but I don't see it falling off. Cons: it felt flimsy and was super small. Pros: not much here either...I didn't give it much time. People on Amazon like it. Cons: it seems femmy, nothing really stood out at me as a wow feature. 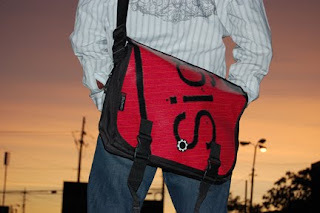 Pros: eco, I like the sling bag, unique design and sturdy. Would easily convert to a day pack when your kid is older. Cons: no stroller strap, material seems like it will get dirty...but you can spray it with stuff. It was a hard choice for me between the Dad Gear messenger and the Fleurville DJ. I wound up going with the Fleurville because it felt super comfy to wear and reminded me of my Double Shot. Plus Jon Stewart supposedly uses one. Oh...one last thing. There is a lot of chatter these days about blog reviews and such, which ones are unbiased which ones are paid etc...I am going to write up my disclosure info soon and add it to my f.a.q. but here's the deal on this post. I didn't get paid by anyone for these reviews. I did borrow some bags but didn't get any free bags...the borrowed ones are back where they belong. I think the fact that Jon Stewart uses a Fleurville is reason enough to buy one! I'm embarrassed to admit I got my first diaper bag because Angelina Jolie had one. It was actually a really nice bag. I got my husband a Diaper Dude and he's never used it once. Ok, I need your opinion. If you've heard of the "push present" that a hubby gets his wife for "pushing" during labor... well, I want to get something like that for my hubby. (He's already given me an early push present!) - I was thinking a diaper bag.. but what things, as a dad, would you like to have??? I got him an "I'm the Daddy" tshirt too from that Daddy Scrubs company. Any ideas off the top of your head? I'm completely using you for your status as a dad, hope you don't mind ;) and thank you! Emily...I love that you're using me for my dad status...you can do it any time. It's a tough decision. The black one from TRU is businessy, but cool looking. The blue one is sporty and looks different. The Dad Gear one you linked to is super similar to the one I reviewed. And I really think their quality rocks. I'd go with that. I love the green but it comes in many colors. Suggestions/Discussion ideas for future Gear Thursdays . . . Baby Bjorn vs. "other" (male appropriate) baby carriers (aka, I'm not gonna wear one of those slings). Wife and I went to a baby boutique a few weeks ago, and the proprietor was selling us on another carrier vs. the Bjorn (forget the name though). Good call A...i do need to start looking at those. thanks.